The Rowland Unified School District is currently in the design process to build a new performing arts center that will be utilized by the community and housed on the Rowland High School campus. 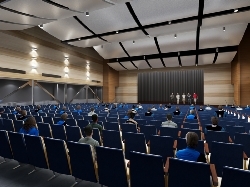 The performing arts center is part of the more than 120,000 square feet of new buildings planned for the Rowland High School revitalization project, including a new two-story classroom building, library and administration building and Multipurpose “Hideout” Room. The performing arts facility will serve both as a performance space and as an instructional facility. A community meeting was held on Oct. 22 to provide design input. A Performing Arts advisory meeting was formed with five representatives selected by the Principals from both Nogales and Rowland High School that includes teachers, students, parents and administration. The representatives met on Dec. 3 with the architect to review and discuss further design features of the theater, including classroom, equipment, and storage space needs for band, choral and drama departments. The Advisory Committee along with an expanded group of PTA, community and Board of Education members will meet in January to review final proposed plans. Here comes Santa Claus, Here comes Santa Claus, right down Manzanita Way! Yes, it’s time for Here Comes Santa visits to our local county parks. Big Red will visit Manzanita Park in Hacienda Heights from 4 to 6 p.m., then slide on over to Rowland Heights Park from 6 to 8 p.m.
Park officials hope to have snow for the kids to play in, but they’re worried about the coming rain. But rain or shine, Santa will show up to talk to the kids. Usually, each child receives a toy, but toy donations are way down according to officials, who want to have at least 300 to hand out. Please call the county parks if you want to help out with a toy donation this year. The Rowland Heights Community Standards District (CSD) will be the topic for this month’s Community Coordinating Council meeting on Dec. 9 at 7 p.m. in Pathfinder Park. Los Angeles County has a set of standards that apply to all of the unincorporated areas. However, the county also allows unincorporated communities, like Rowland Heights, to modify certain aspects of the county wide standards to meet the needs of their specific area by the formation of CSD’s. A community can adopt standards that are either more or less restrictive than the county’s. Board member Kingdon Chew will review areas of our CSD that might need to be changed. These include the standards for commercial and public parking spaces, commercial signage standards, changes that might be needed to deal with the problems created by tour bus operators when they pick-up and drop-off their customers, residential setbacks to provide for public and vehicular safety, and community concerns regarding residential RV parking standards. If time permits, Kingdon will also speak on the permitting process required for residents or commercial property owners who want to make changes to their properties. Please plan to attend this important meeting and voice your concerns or support regarding the changes that are being suggested. Bring a friend or neighbor.